A microchip is a safe, simple and permanent form of pet identification to immediately identify lost pets and quickly reunite them with their owners. 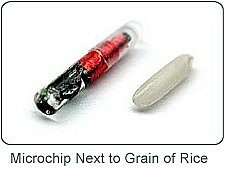 The microchip is injected under your pet's skin over the shoulders. Each chip contains a unique barcode (much like those seen on products in stores). The chip is gentle to the tissues, and does not cause a reaction to the body. When a scanner is passed over the pet, the bar code is read. You can register your pet with his or her specific barcode online. The owner is responsible for keeping information current with the registered microchip. All veterinary hospitals, shelters, and rescue groups have scanners.